A favourite board game brought to life on stage will have you guessing ’till the end! On a dark and stormy night, six unique guests, plus a butler and a maid, assemble for a dinner party at the home of Mr. Boddy. When their host turns up dead, it is clear that no one is safe! Soon the guests are racing to find the killer and keep the body count from stacking up. Was it Colonel Mustard in the study with the gun? Miss Scarlet in the billiard room with the rope? 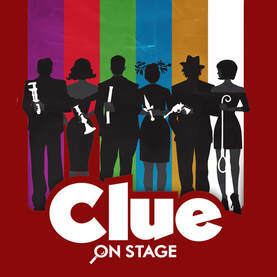 Clue On Stage will leave audiences in stitches as the guests figure out… WHO did it, with WHAT, and WHERE!